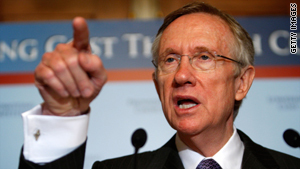 Senate Majority Leader Reid may not have the 60 votes needed to clear Senate procedural hurdles. Washington (CNN) -- It is a busy week ahead, to say the least, and perhaps a telling one in the health care debate. Senate Majority Leader Harry Reid is said to be close to settling on a health care bill that includes a government insurance option, but does allow states to "opt out" if they don't want to participate. "I think we're very close to getting the 60 votes we need to move forward," said New York Democratic Sen. Chuck Schumer, a key Reid deputy, on NBC's "Meet the Press" Sunday. Close, but not there, which makes it a risky strategy. Not only does Reid not have commitments for the 60 votes he would need to clear Senate procedural hurdles, the "opt out" approach also is unacceptable to Sen. Olympia Snowe of Maine, the only Republican to vote for the Senate Finance Committee's health care proposal. So Reid risks losing Snowe and angering the Obama White House, which very much wants Snowe's vote so it can call the plan "bipartisan." And he risks losing if he can't win over some reluctant moderate and conservative Democrats -- like Sen. Ben Nelson of Nebraska. "I have made no promise," Nelson told us Sunday. "I can't decide about the procedural vote until I see the underlying bill." Senate leadership sources have been down this road with Nelson before, and believe he can be swayed. But it's a fluid situation -- and packed with drama. • President Obama hits the campaign trail Tuesday at Old Dominion University, looking to rally African-American turnout for Virginia gubernatorial candidate Creigh Deeds, who trails heading into the final 10 days. • A number of congressional hearings exploring the economy, jobs and the potential impact of "green jobs." The impact of the stimulus legislation, for example, will be debated at a Thursday hearing of the Joint Economic Committee. • The Conference Board weighs in with new consumer confidence data on Tuesday, and the government's data on new home sales and third-quarter gross domestic product will be closely watched for clues of recovery. That GDP report is due Thursday, which just happens to be the 80th anniversary of the 1929 "Black Tuesday" stock market crash. And lastly, the NBA season kicks off this week and the World Series is scheduled to get under way. Just in case you need a break from politics for a few hours.